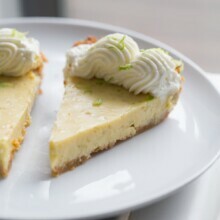 There is no better, more refreshing dessert than Key Lime Pie! Sweet, creamy and tart, this Key Lime Pie Recipe will have you swooning. In a small bowl, mix graham cracker crumbs with melted butter and granulated sugar until completely moist. Pour into a glass pie dish and press evenly into the bottom and up the sides. Bake 8 minutes until lightly golden brown. While crust is baking, stir sweetened condensed milk together with egg yolks, lime juice and lime zest. Once crust is pulled out of the oven, pour in filling, smooth the top and bake for another 15-20 minutes or until set. Remove from oven and cool completely before covering and refrigerating. To serve, cut pie into eight even pieces and top with whipped cream.